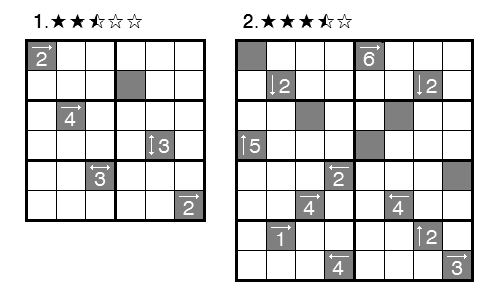 Enter numbers from 1 to 5 (from 1 to 6 in second puzzle) into white cells, so that in every row, every column and every bold bordered area every digit appears exactly once. Number represents the height of skyscraper in the cell. Number with arrow indicate how many skyscrapers are visible from that direction. In this puzzle, the grid is toroidal. This is one of my puzzle experiment series. 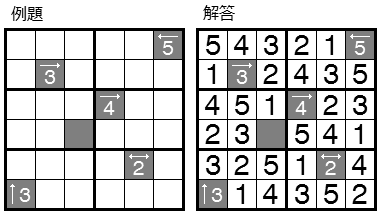 Numbers are placed inside of the grid. But almost techniques for standard skyscrapers can be applied. Please pay attention to interaction among arrows.